So here's the problem: I have a table of purchases, and want to create one partition for each year between 2015 and 2018. I have a fact table like this, and want to split into partitions (let's say one for each year). I could set up my partitions manually using the SSAS Tabular menu, but I want to programmatically create them all in one go. How to proceed? This blog doesn't give a full answer, but instead summarises all of the approaches that you can take. 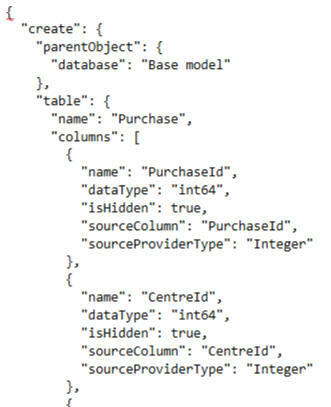 You can do this in a normal database, but because you're connected to an SSAS database it will generate TMSL, not SQL. The start of the script generated. The file (if saved) has an .XLMA extension. You can use this site to see how to write TLMS to generate partitions. If this sort of thing is meat and drink to you, go to this Microsoft site giving you more details. This method uses either this SSIS task to run an XMLA file that you've created dynamically, or uses an SSIS script task. 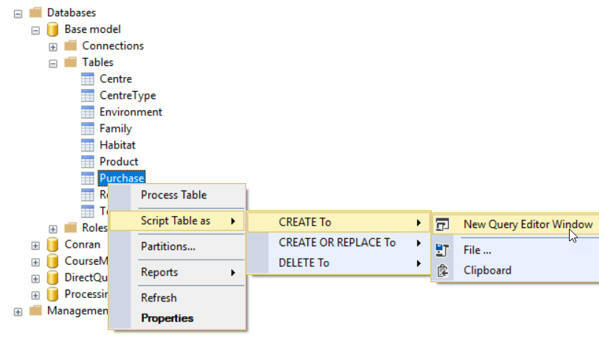 You can see more details of how to create dynamic partitions in tabular models within SSIS here. If this floats your boat, you can see full details on how to proceed here. SSAS Partition Manager is a third-party program which does what its name suggests! So ... which one would I choose? It's all down to what you currently know. I know C# and SSIS, so I'd probably go for the 3rd solution, but if you're a PowerShell guru I'm sure the 4th method would make more sense. However, the honest answer to which solution I'd choose is ... none of them. 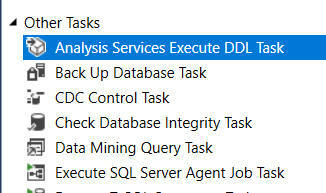 I'd like a solution which runs within my SSAS Tabular project, and this doesn't yet seem to exist!